It is easier for the earth to exist without the sun than without the Holy Sacrifice of the Mass! The biggest challenge in the understanding of the meaning of the mystery of priesthood is a lack of awareness in the priest of the gift and the mystery of the Holy Mass, and of the place of the priest in the dimension of the miracle of every Holy Mass (Alter Christi). This connection of priesthood with the Holy Mass, in the Holy Mass, is a miraculous union of man with God. Such a gift is attained only by the priest. A breakdown of this union is a prelude of the end of the church. Where takes place the rebirth of the Holy Mass, there ensues the rebirth of the Church. 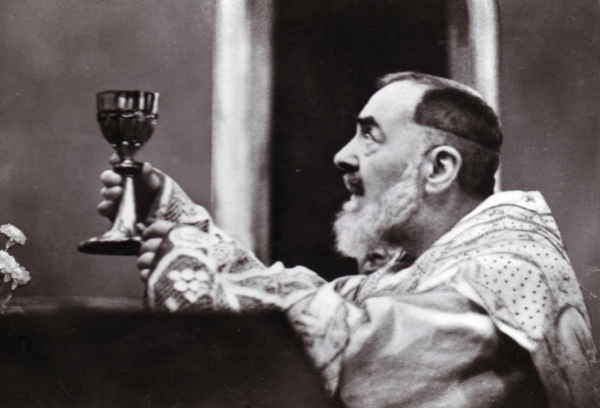 To help the modern Catholic in learning the truth about the mystery of Holy Mass, I hand over to the Dear Reader a great gift, which is our next editorial initiative, The Mystery of the Holy Mass according to St. Padre Pio. From the graciousness of God, in the days of 20-30th of June 2013, we have been given messages about the Holy Mass by Saint Padre Pio. The first four messages – these were personal invitations of Saint Padre Pio. With the subsequent five, Saint Padre Pio came upon my humble request. These messages became the basis for the delivery of over 30 sermons on our small internet television Christus vincit –tv. 2) Without women and altar girls at the Altar. 3) Without extraordinary ministers of Holy Communion. 4) Without turning towards the people at the beginning of the Holy Mass. 5) Without a sign of peace before the Lamb of God. By inviting you to read these messages, I remind the Dear Reader, that the ground on which the Holy Mass is celebrated is holy, and “the Majesty of God descended on earth, and makes you witnesses of this glorious event during every Holy Mass. God comes down to earth, yet He does not fully show His Majesty. He remains deeply concealed and hidden. In His humility, He does not show to the world His true power, but He humbles Himself, diminishes, and enriches man. Oh My children, if you only believed in this great event, what a great power would have for you ever Holy Sacrifice. To meet with God face to face, to accompany him during His birth and death; o people of all times, God is calling you during the time of the Holy Mass to participate in His Holy Sacrifice, in the most important moments of His glorious life! He is calling you not only so you may accompany Him, but He makes you partakers in His holy Sacrifice. Man does not understand the great mysteries of God, but through faith he can grasp them much more than he could make it through reason, because reason and faith remain at odds when God reveals his secrets.” (Message of the Mother of God, Compendium II, p.145-146).